A digital multimeter can be used to measure voltage, amperage and resistance. Resistance values are measured in ohms, thousands-of-ohms, and millions-of-ohms. The reading on a multimeter display will depend upon which measurement type is selected on the multimeter's selection dial. Using a few simple steps will give you an understandable reading on the meter's digital display. Turn your multimeter selection dial to measure megohms, if the resistor is known to be at least 1 megohm. (A megohm is 1 million ohms.) Touch the test probes to the device being tested, one probe to one wire lead and another probe to the other wire lead. In the case of measuring ohms, the device will be a resistor. On the display you will see a whole number to the left of a decimal, and a four- or five-place decimal value to the right of the decimal. If you have your dial set to megohms, the whole number to the left of the decimal represents how many millions of ohms the measured object contains. The decimal numbers to the right of the decimal point represent the number of ohms that aren't quite a million ohms. This portion of the display is showing the number of kilohms, or thousands-of-ohms. Alternatively, you may set the multimeter dial to measure kilohms rather than megohms. In this case, if the resistive load is below at least 1 megohm (1 million ohms) then the meter will show the whole number of kilohms (thousand ohms) to the left of the decimal mark and the numbers to the right of the decimal will be displaying hundreds of ohms. Write down how many megohms or kilohms the tested component was observed to have, as displayed by your multimeter, and use the measurement for calculating any additional circuit values as desired using the data. Keep in mind that in mathematics, mega means "million," kilo means "thousand," milli means "decimal millionths" and micro means "decimal thousandths." With these matters of scale firmly in mind, you will be better able to understand your device measurement readings. Follow the tutorials presented with this article to serve as your reference if you experience any difficulties, and consult your owner's manual for settings specific to your meter. 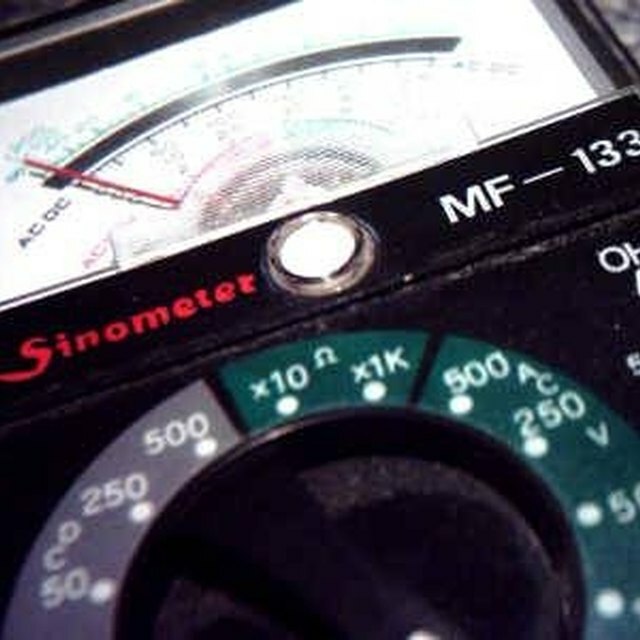 Never try to measure voltage when the multimeter dial is set to measure ohms, as this will destroy the meter's circuitry.